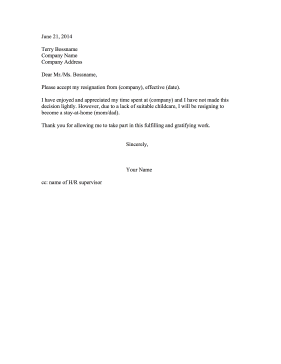 Make a statement about unacceptable childcare conditions in the workplace with this parent resignation letter. I have enjoyed and appreciated my time spent at (company) and I have not made this decision lightly. However, due to a lack of suitable childcare, I will be resigning to become a stay-at-home (mom/dad). Thank you for allowing me to take part in this fulfilling and gratifying work.